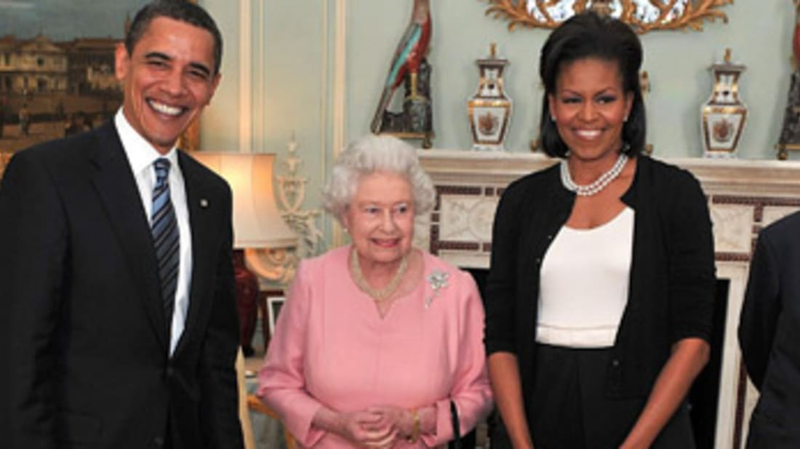 The news media both here in London and in the States made much of the encounter between Michelle Obama and the Queen, during which the Queen put a tentative hand at Michelle's back and Michelle responded by putting her arm around the diminutive Queen. The interchange lasted all of 10 seconds, but The Hug that Was Heard "˜Round the World was enough to keep news outlets in stories and op-eds for days. And for good reason: Physical displays of emotion, of whatever variety, have long been no-no's in Royal protocol. And touching the Queen "“ well, there was a time when your head could have been on a pike outside the Tower. Firstly, don't speak until you're spoken to. But after that, when you meet the Queen, it is customary to address her as "Your Majesty" at first, "Ma'am" thereafter, and then, "Your Majesty" again upon taking your leave. You should also stand up when the Queen enters the room "“ everyone, including her own son and grandchildren, is required to stand when the Queen enters the room. And whatever you do, for God's sake, don't wink. When George W. Bush accidentally made the gaffe, he said she "gave me a look that only a mother could give a child." Bow, curtsey, or a handshake? Citizens of the United Kingdom and Commonwealth countries, upon meeting the Queen, should, in the case of men, give a short bow from the head and shoulders, or, in the case of women, curtsey. But as Americans, because of that whole Revolution thing, we don't have to bow or curtsey "“ a gentle handshake will do just fine. It's also customary to bring a gift for the Queen; the Obamas brought an iPod featuring video footage of her visit to the States in 2007 and a rare musical songbook signed by Richard Rodgers of Rodgers and Hammerstein, prompting all kinds of discussion about the worthiness of the gifts. By comparison, in 2007, the Bushes gave her an inscribed box from Tiffany's, a leather document case containing copies of historical documents from the National Archives, and an inscribed cowgirl statue, a replica of the one standing in front of the National Cowgirl Museum. No, really, it happens. People actually have tea with the Queen. And when it does happen, there are a few things to know: The Queen always eats first, and when she stops, you stop eating as well. When you sip from your cup, it's polite to hold only the teacup, not the cup and saucer, andÂ remember, pinkies out. Don't slurp. And try not to leave to go to the restroom. Just hold it. While it's not technically forbidden, incidents of touching the Queen beyond just a polite handshake are very few and far between. One of the most memorable was back in 1991, when Alice Frazier, a then 67-year-old resident of Washington, DC public housing, hugged the Queen during the monarch's 13-day visit to the States and invited her to stay for a lunch of southern fried chicken and potato salad. The Queen politely declined. Ms. Frazier's hug was certainly not politically motivated, but other incidents of Queen-touching have had some measure of political meaning ascribed to them. In 1992, Australian premier Paul Keating placed his hand on the Queen's back, presumably to direct her to her seat, however, the gesture was by British media as representative of Australia's deep-seated republican desires. For it, the Prime Minister was dubbed the "Lizard of Oz. " In 2000, another Australian premier, John Howard, allegedly committed the same offense, a charge he hotly denied. It is considered impolite to turn one's back on the Queen "“ anyone who's seen the HBO miniseries John Adams may remember John Adams (or rather, Paul Giammatti as John Adams) meeting King George and the awkward attempts at formality. In general, one doesn't have to be quite so tortured and it's not an entirely hard and fast rule. The royal corgis may be dogs "“ but they're still royal and as such, should be treated with courtesy. Especially because they bite. The Times online dug up some useful information on the Royal hounds, the Queen's collection of corgis, including one item from 1939 reported by their "kennel correspondent" about the first corgi to appear on the end of Royal leashes and about the fair few who have been bitten by the short, squat little royals. More often, however, it's royal in-fighting that seems to get the better of the dogs: Reports of the royal dogs literally tearing one another to shreds tend to surface from time to time and, in 1991, the Queen herself suffered a bite to the hand requiring three stitches after trying to break up a corgi fight. With that in mind, it's best to approach the dogs gingerly, with respect, and to not make jokes about bad-behavior. Avoid making eye contact with the dog, let him sniff your hands first before petting, and never turn your back on an angry dog. If you've ever wondered what life is like for the Royal pack of corgis, check out this video cheekily reported from inside the dog house.